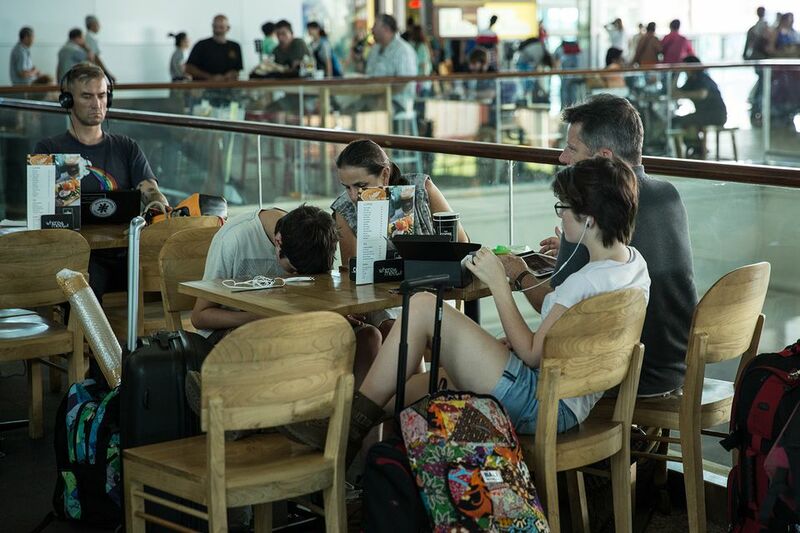 If you're traveling to or from Auckland Airport there are a number of restaurant and cafe options. There are a few to choose from in the international terminal and also some in the shopping areas close by. Most of the latter are within walking distance or a short taxi ride away. Here are some of the choices available. Most of the eating places are in a central food court area within the terminal building. If leaving on a flight, the best selection will be found in the public area before you enter departure security. Hayama Sushi Bar: Nice Japanese food. Mac's Down Under Bar and Cafe: Casual bar food, from light snacks to meals. Silk Road: The menu here contains a range of Asian cuisines, including Chinese, Indian and Thai. Zarbo Cafe and Bar: Delicatessen-style foods and main meals, with a good selection of vegetarian and gluten-free dishes. There are nice views of the Manukau Harbor from the dining area. Emperor Lounge: Several airlines have their own lounges for business and first class passengers. However, there is another lounge available for all departing passengers. The Emperor Lounge is located after security and for a fee of $49 per person provides buffet meals as well as complimentary wi-fi and shower facilities. The Lounge should be booked in advance (preferably at least 24 hours) to guarantee entry. Open 6 a.m. to 11pm daily. Szimpla Gastro Bar: This is located underneath the Formule1 Hotel, a few minutes from the terminal buildings. It's the best place to eat in the Auckland Airport area, and probably one of the best in the South Auckland region. It's innovative and hearty pub fare, with a South Pacific twist. There's also a good selection of beers, including boutique beers on tap. The kitchen is open from 10 a.m. until 9 p.m., although drinks are available until later. Papillon Cafe: This is adjacent to the Butterfly Creek adventure park, on the left if heading south from the Airport towards Manukau and the southern motorway. There's a good selection of cabinet food and simple meals in a nice setting overlooking the park. Open daytimes only until 5pm.